← Is Your Glass Half Full — of Iced Coffee? Online dating for women over 50 is, unfortunately, a mine field because scam artists abound.Before you approach a man on Match.com or respond to a message, take a good look at the photo. If your first impression is “He’s good looking,” check again. Does he almost look like a movie star? Next, look at the profile. Are there any grammatical mistakes that make it appear that someone whose first language wasn’t English wrote it? Many con artists operate from counties outside the U.S. and English isn’t their native language. If the man is hunky and the language in the profile is a little “off,” it’s a good idea to do a reverse Google image search to try to determine if he’s who he claims to be. In one case, a very nice-looking man said in his profile that he lives in Charleston (where I live) and is retired. When the thought occurred to me that he looked like a wealthy movie star, I decided to check him out before contacting him. It turned out the exact same photo was on Linked In for an actively-employed senior partner in a Los Angeles law firm — not a retired man in South Carolina. Another time the exact photo I checked out appeared on a page where several women announced, “This man is a con artist!” and wrote about how the man tried to con them into giving him money. 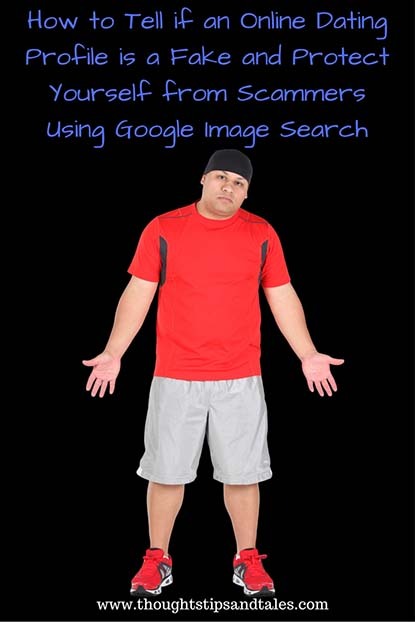 You can protect yourself from scammers using Google image search. 3) Click on the camera icon, and it’ll open to Search by Image. 4) Select Upload File, and choose the photo you just saved to your desktop. Some “computing” will take place and a list of pages where the image — or similar images — occurs will appear, along with the photo. See what comes up… and decide where to go from there. This entry was posted in dating, life, miscellaneous, online dating, online dating horror stories, online dating scams and tagged dangers of online dating, how to search for an image online, how to tell if an online date is a scam, how to use Google image search, online dating dangers, online dating scammers, online dating scams, over 50 online dating scams, protect yourself from online dating scammers. Bookmark the permalink. Great advice for those dating. My cousin was the victim of an overseas scammer. With so many women using online dating, this is so valuable! That’s terrible. A friend of a friend was also taken for a lot of money — all her retirement savings. It can happen to anyone. thanks. I never knew how to do an image search! It’s pretty easy when you do it this way. You can also drag the image to the browser, but I always have trouble doing it that way!